Made in America, the Tuft and Needle mattress is made of polyurethane foam 10 inches in thickness which isn’t memory foam and nor does it consist of latex or springs. The top 3 of the 10 inches are made of a pressure-relieving foam, which consists of some elements of latex and memory foam. The texture is similar to memory foam, but offers more bounce. The remaining 7 inches of foam is high density, similar to what most mattresses on the market today are made of. A five-inch model is also available, appropriately named “the Five”, which is slightly decreased in price. It is somewhat firmer than the 10 inched models since it has less foam which then forms your body frame. The weight-alleviating layer is 1.5 inches on this unit, and the bolster layer is 3.5 inches. The Five is an incredible and convenient choice for areas like apartments and guest bedrooms. As well as for those who prefer a firmer cushion. Mattresses are very personal and created to bring comfort and security. What might be a good option for some may not be comfortable for others. Still, in distinction to the reviews about the Tuft and Needle Mattresses, it seems to be getting an increasing amount of positive testimonials. Part of the reason is because of the price; while the Tuft and Needle are considered a high-end mattress, the cost ranges from $350 for a Twin to $750 for the California King. There has been lesser quality mattresses priced for much more on the market. Many consumers appear as though they were a bit thrown off by the Tuft and Needle’s all-foam construction upon receiving it. Some equated it to a large “foamy” product but once they unpacked it, set it up and lay back onto it, they soon realized it was an extremely comfortable and a very “relax” inducing mattress. The Tuft and Needle Sags Less over Time. One of the problems that can arise with an all-foam mattress is over time they can begin to sag but customers who have had the Tuft and Needle for a year or more; claim that this unit hasn’t begun to sag at all. Even those who might be larger in girth than the average person have also claimed amazingly similar results. Mattresses aren’t meant to last forever but this is a refreshing change to an innovating industry. As we have mentioned, one of the concerns for certain owners of the Tuft and Needle mattress is that it’s quite firm. Although the top 3 inches of the layer may have a bit more bounce to it, again, it not memory foam. A few people have tried out the mattress for 6 months or more and have found it too stiff for their liking. As mentioned above, not every mattress is for everyone. Contrary to those owners, some also claim it’s too soft. This goes to show that the opinions of others is not the best deciding factor to rely on when understanding if this is the right choice for yourself. We each prefer different consistencies of softness and firmness, but regardless of differing opinions, there are many people who find the Tuft and Needle mattress ‘just right’. Tuft and Needle ‘5’ and Box Springs. Owners of the Tuft and Needle 5 have stated that it cannot be used with a box spring, as the mattress is too thin to sit on top of properly. Some experience sag and difficulty in keeping sheets on the bed while owners of the 5-inch model have stated that they find it more firm and satisfactory than the larger varieties they have tried. Smaller Tuft and Needle Mattresses Preferred? We ask this question based on a substantial amount of individuals claiming the smaller varieties of the mattress don’t wear out as fast. Larger mattresses have caused a few mixed viewpoints, but there are custom frames on the market that can offer a great option for those who are looking for just the right fit for their larger Turf and Needle. 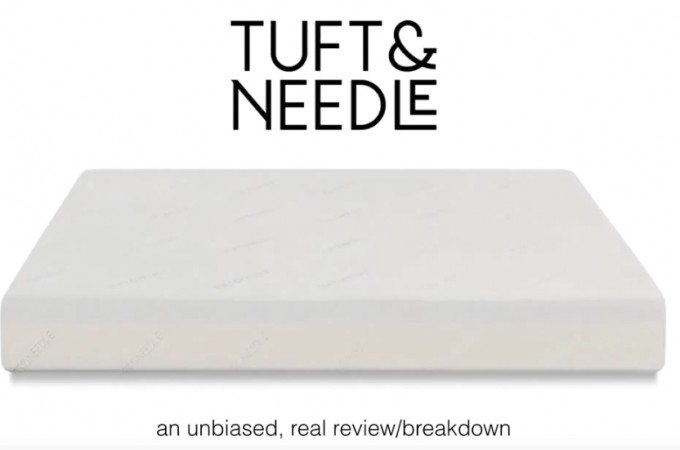 Out of all the reviews of the Tuft and Needle mattress we have observed, there has been constancy across the board – several consumers have had to purchase an extra top for the unit which is not something new. Many people buy extra cushioning for the tops of high-end mattresses based on their own taste and style; it all comes down to what aesthetically pleasing style you prefer and what kind of firmness type your body is accustomed to. So is the Tuft and Needle Mattress a good choice? There are many answers to that question and we’ve covered a lot of the pros and cons which are genuine and authentic, promoting that comfort, convenience, security and simplicity are at the head of the list when it comes to making the best decision. These proudly made American mattresses have been modified and designed off purely customer feedback over the past two years, making the comfort unparalleled in support. The “perfect” fit comes from a state-of-the-art technology that evenly distributes your body weight throughout the mattress and creates a not too soft or hard, float-like feeling. Quickly adapting and rebounding to your body weight while at the same time taking the excess heat and absorbing it into the foam. The genius engineering that go into the designs of the Tuft & Needle has been the right choice for many comfort connoisseurs. We recommend that you go to your local mattress dealer and lay on one to truly understand. These meticulously designed mattresses are ones that should be tried out first before any judgment is placed. One thing will always be undeniably true, personal preference plays a big part in whether or not this mattress is right for you but the majority of reviews have spoken, and many love the purchase they have made, speaking very highly of the Tuft & Needle mattress and giving it the title as one of the best in the industry. © 2019 Mattress Reviewer. All Right Reserved.